It may only be February, but so far this qualifies as my book of the year. A meaty old-fashioned adventure story that is modern in tone, has memorable characters, a scintillating plot, clever communication of scientific knowledge, and oodles of emotional depth. It’s also extraordinarily well written, and looks on the outside as good as it is on the inside, with beautifully colourful insect illustrations sprayed on the pages’ outside edges. With his mother dead, and his scientist father having mysteriously disappeared whilst working at the Natural History Museum, 13 year old Darkus is left no other choice but to move in with his kindly Uncle Max. But Darkus is determined to discover the truth behind his father’s continuing absence. When a rhinoceros beetle with intelligent communication skills seeks him out, Darkus realises that there is a hive’s worth of mystery to be solved. The villain of the piece, Lucretia Cutter, has elements of Mrs Coulter and Cruella De Ville, but manages to be a perfectly contemporary villain in that she is a mash up of fashion designer/mad scientist. To keep her real, she has a daughter, Novak, who is starved of attention and affection, and who plays a key role in helping Darkus. But the overwhelming theme, which infuses the characters and the settings is beetles. M G Leonard has woven this fascinating element into all areas of the novel – they permeate the building into which Darkus moves – swarms of them live in the flat next door, which again, is not all it seems. But the beetles also intrude into the main settings – from the Natural History Museum to the cavernous den that Darkus and his friends make in the yard out of discarded furniture (it not only uses insects in its make up, but represents their habitats in its layout), to the hybrid villain of Lucretia Cutter who is more insect-like than she first appears. These elements all combine to make a hugely visual novel – the tea cup tower habitat of the beetles is kaleidoscopically depicted, Lucretia’s house and entrance is graphically described, and even the small description of Darkus’ room in Uncle Max’s house smacks of insect imagery – from the canvas which “cocoons” Darkus to the “hard-backed” books in the room – like a beetle’s exoskeleton – to the dusty places where insects might scuttle. There are also hard facts carefully dripped throughout the adventure – giving the reader knowledge about beetle behaviour, ecology, habitats, species etc. But it doesn’t matter if you don’t find beetles agreeable – they just lend an extra layer of knowledge and depth to a fascinating adventure story. Darkus is an intensely likeable protagonist – with wit, depth of feeling, determination, and masses of emotional empathy – displayed through his feelings for Novak and his loyalty to his father. Uncle Max displays plenty of pathos too. The rounded characterisations zing off the page. Darkus is also one of those fantastic characters you’d happily invite round for tea – a character with whom you want to spend all your time. The book was reminiscent of the best of today’s children’s storytellers – such as Piers Torday – with his dastardly villain Fenella Clancy-Clay and the cockroach in The Last Wild trilogy. 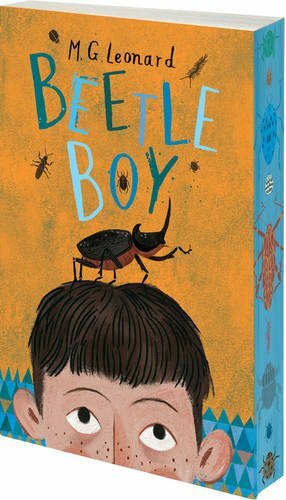 Beetle Boy is exclusive to Waterstones for the month of February, and published generally on March 3rd. I would use your antennae to seek out a copy as quickly as possible – with such original, rich storytelling you’ll want to burrow right through it. You can buy it here from Waterstones.